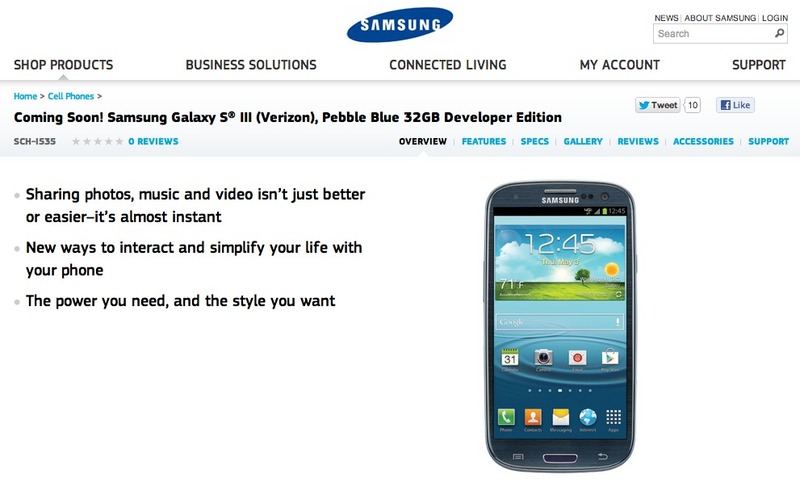 A landing page for the Samsung Galaxy S3 “Developer Edition” that will run on Verizon’s network has gone live this evening with a “Coming Soon!” tag attached. We aren’t seeing a price, but have already been told that it will retail for $599. If this page is accurate and the “Developer Edition” will sport 32GB of storage, then those who buy will actually end up with a deal. The 32GB versions sold through Verizon run $649. As a reminder, if you are interested in this device, you have to purchase it directly through Samsung’s store. The version that Big Red sells is subsidized and comes with a signed bootloader. There are rumors of a possible software patch to unlock the bootloader on the Verizon version, but we aren’t ready to fully buy into that unless we hear it directly from a VZW executive. For those that can’t live without a fully open Android device, but need to stick with Verizon, this is your option. Update: A 16GB version is appearing on Samsung’s site as well. I would guess that the 16GB version will run $599 and the 32GB version at $649.